Last night we had the second successful meeting of the Planning Committee for establishing a nonprofit corporation to support a Garland Community Garden. After the meeting, Anita Opel, one of the members of our committee, lingered and among other things we discussed the value of eating raw food. While I am introducing more raw food into my diet, I have not gone as far as Anita and her husband, Robert, whose diet now is vegan and almost entirely raw food. However, last night I took a daring step and ate a whole raw oka pod from my Urban Garden One with Anita! If there is an afterlife, my mother and both my grandmothers have fainted as all of them fried okra until it was burnt and/or boiled it until it was gray and indistinguishable slime floating in the gumbo--or worse, served as a side dish. 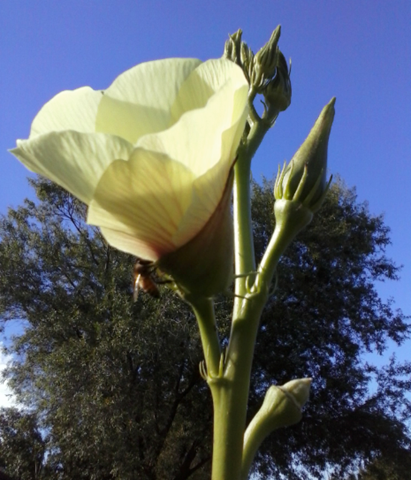 In fact I was so surprised and enthusiastic about the great taste of the okra that I ate another, just to make sure. Last night I ate two raw okra pods. Embolded by my own bravery, I also ate a raw Japanese eggplant and several green tomatoes from my garden. They all tasted wonderful. I don't know that I'll ever convert to a 100% raw diet because I love spices in cooked foods, but I'll definitely explore the possibility of adding more raw foods to my diet--especially those that I've thought of as being in the "must be cooked" category. One of the classes we will likely bring to the educational offerings of our Garland Community Garden will be: Rethink Your Relationship to Food--Raw is Healthy. For this class we will let the participants pick a raw vegetable from the garden (one that is normally cooked such as okra, green beans, egg plant, etc.) and eat it raw. We will record the participant's reactions and keep a file of them on our website. Of course there will be more to the class than this, but this exercise will be the fun part. A Closing Note on the Nutritional Value of Okra--Just in case someone is saying "ugh"
This food is low in Saturated Fat, and very low in Cholesterol and Sodium. It is also a good source of Protein, Niacin, Iron, Phosphorus, Zinc and Copper, and a very good source of Dietary Fiber, Vitamin A, Vitamin C, Vitamin K, Thiamin, Riboflavin, Folate, Calcium, Magnesium, Potassium and Manganese. Margie [my neighbor across the street and also a member of the Garland Urban Agricultural Center and Community Garden planning committee] and I hiked around an area of the site today that is located in what I call the "panhandle" of the property. The mission was to find an old abandoned cistern that Margie thought was on the site in this area. Turns out that Margie was right. 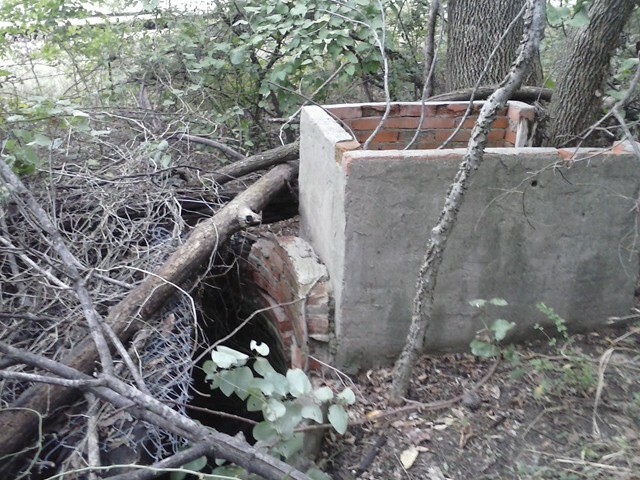 The property does have an old abandoned cistern and it is not filled in with dirt--yea! It will be easier to restore. Still, there is a lot of repair needed to the brick and morter work of its interior. It will be Mark Farley who is in charge of researching sources for our water supply, and the team who join him to determine if the system is salvagable. I'm hoping that it will be. If so, we could run PVC pipe from the cistern down into the area where the gardens will be located. The cistern looks fairly large and deep--about six to eight feet in diameter. 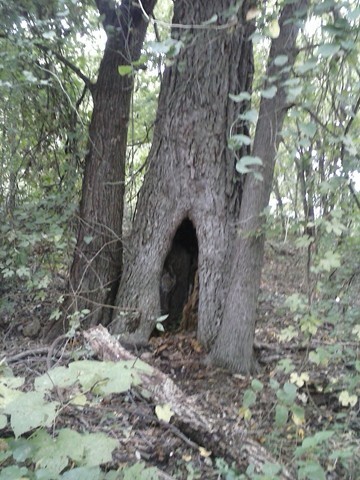 Near the abandoned cistern (about 15 feet away) we saw a gnome home. Margie and I discussed at some length the possibility that the gnomes, second cousins to trolls, were responsible for the damage to the cistern. I knocked on the door, but no one was home. No doubt the gnomes were out making more mischief. During our walk, I noticed a lot of white things sticking to my legs. "Oh that's just beggar's lice." Margie informed me. At first I was horrified at the mention of lice, but it turns out that beggar's lice is the name for small sticky seeds from some plants that attach to clothing. I can see how they got their name as they are white (but much larger than lice). Who knew? Certainly not I. 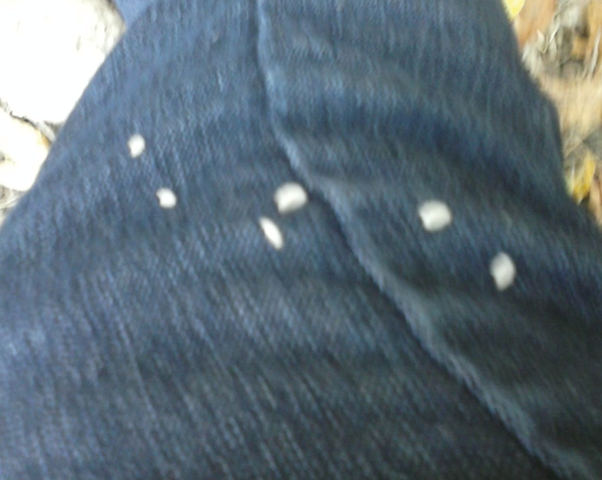 Below is a photo I took of the beggar lice on my pants leg. 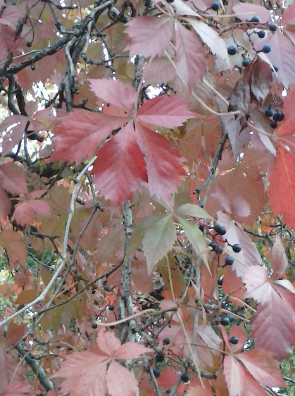 We saw maybe Virginia Creeper? If you can identify this one, let me know. 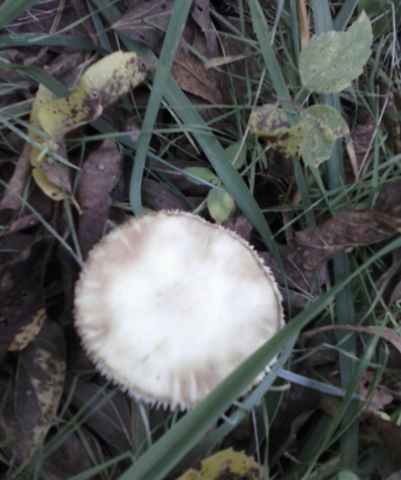 I looked in my mushroom book when I got home but I was unable to identify it. Can you? 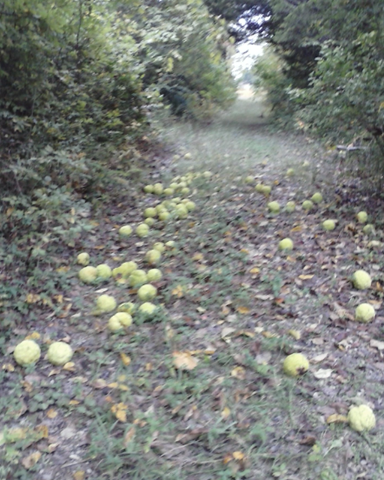 We saw lots of horse apples. In fact Margie brought about 15 of them back home with her. Margie's home is not on a slab, thus she has crawl space underneath. Apparently cockroaches, other insects and even mice are reported to dislike the smell of horse apples. Thus people toss them in their crawl spaces as a pest deterrent. Have I mentioned yet today how excited I am about being a co-creator for the Garland Urban Agricultural Center and Community Garden? Well, I am. We still have room for 7 more people on the Planning Committee. At the moment we have a baker's dozen. If you are a Garland resident and would like to be on our team, please RSVP to eebemma@yahoo.com. Our second meeting is tomorrow night: Wednesday, October 30 at 6:30 at my home. After we have the full 20 people, people will still have the opportunity to join one of the subcommittees headed up by members of the planning committee. As I mentioned in a previous post, I grew three of the best-tasting cantaloupes from a five gallon pot this summer. You don't even have to spend a lot of money for a pot. For example you can purchase a five gallon Homer bucket for five dollars or less, drill a few holes in it, fill it with some half-way decent soil and voila! You have everything you need but the seed to grow just about anything--from tomatoes to eggplants. If you wish to get fancy, you can cover the outside of the bucket with colored cotton fabric, using Elmers glue and then seal the covering. You can even use the bucket for a mold and create many concrete pots for your garden. 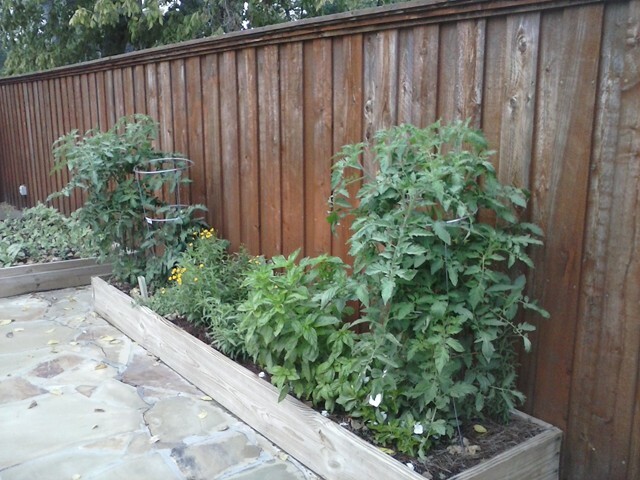 In the spring Charlie built several wooden containers and planted a great garden. He just built some wooden frames, put them on top of the flagstone, filled them with dirt, and planted seeds. Over Labor Day he broke his foot in a motorcycle accident. 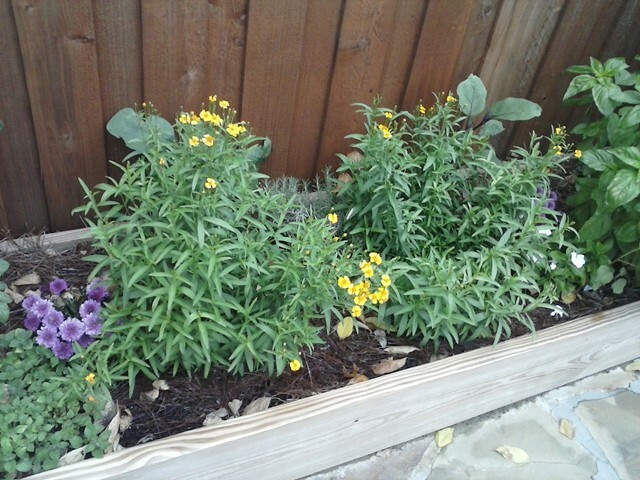 Here in Texas, our two best growing seasons are spring and fall. 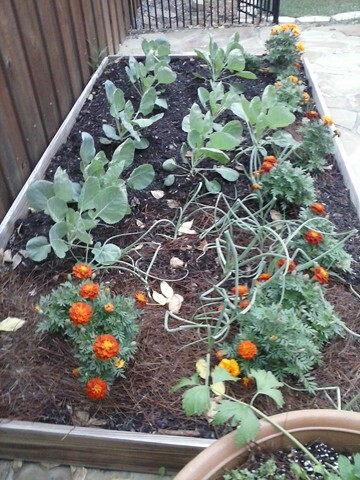 In a moment of weakness, I took pity on Charlie and planted his fall garden (albeit a little late). Below you can see photos of the garden I took this morning. 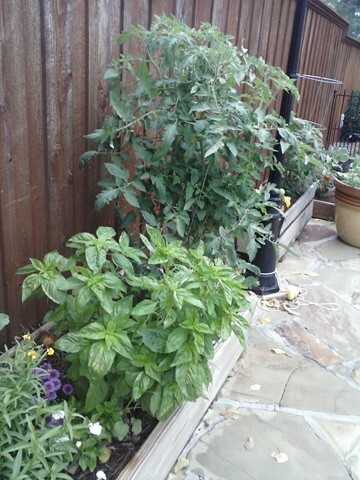 It's a great example of just how successful a container garden can be. This entire garden is a container garden. I'm looking forward (and hoping) to see the brussel sprouts when they form as I've never seen a brussel sprout growing on the plant. 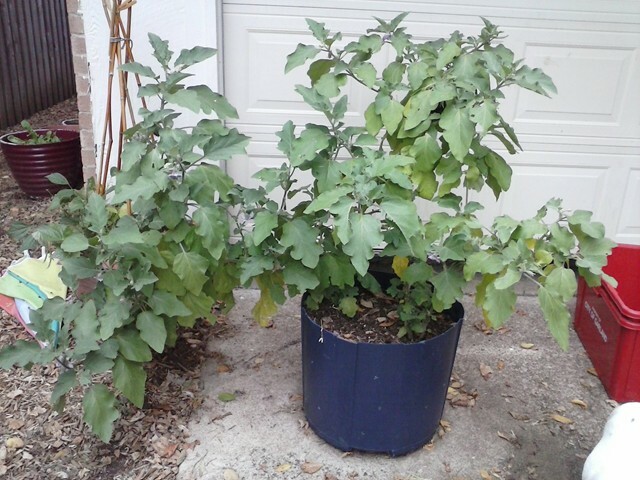 Charlie has six tomato plants in his container garden. Below you can see two of them on either end of the planter below. Harvest the Rain is the book I have been waiting for: a detailed "how to" for people and communities wanting to take a major step in saving the world's water written by a passionate water conservation advocate. Can there ever be "too much of a good thing"? If so, then this weekend is certainly one of those times. On Friday Charlie and I attended Nate Downey's lecture at Brookhaven College on Water Harvesting. Then yesterday I attended "RETHINK COMMUNITY - Garland Texas" at the Hyatt here in Garland. Both events were crammed with interesting and relevant content for anyone interested in improving the quality of their life and the lives of others in their community. I've already raved about the RETHINK COMMUNITY event in Garland yesterday and now I'll rave on about Nate's presentation on Water Harvesting. Nate Downey is a permaculturist from Santa Fe. His company, Permadesign, is described in Nate's words as ". . . a landscape-architecture firm for a new world. Wherever you are, we’ll help create comfortable outdoor environments packed with value. Nestled among luscious edible gardens or elegant low-maintenance landscapes, our projects usually start with “water harvesting” a critical step toward a sustainable future." 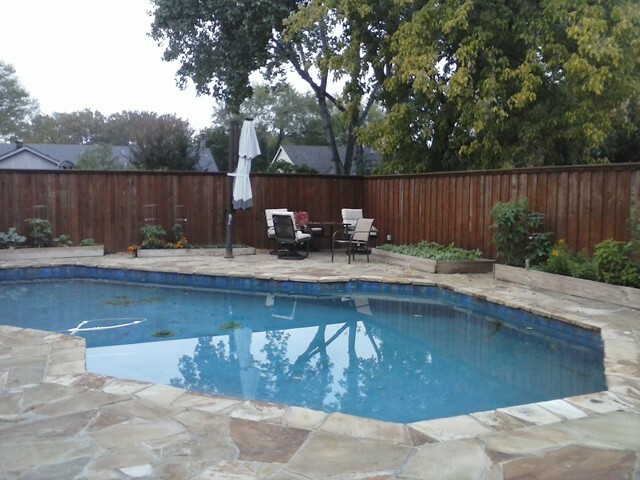 Back in the spring (before I dug up my front lawn and replaced it with a garden of edibles) I calculated that at least for my geograhical place on the planet here in Garland Texas we have enough annual rainfall to grow just about anything. 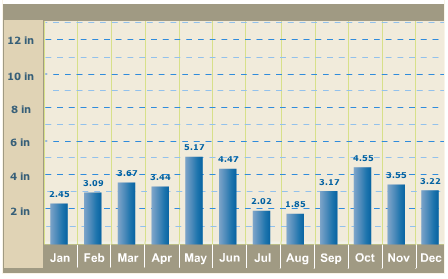 Look at the graph below for our annual rainfall here in Garland and consider a 1000 square foot roof surface of an average-sized home yields 650 gallons of water from a 1 inch rainfall. Thus, with adequate storage, every home in Garland could harvest approximately 26,000 gallons of water each year--more than enough water to support a garden to feed a family of four. I find it somewhat sad that many people are so quick to embrace austerity as a solution and install rocks and cactus--when in many cases it is not necessary. The problem is not that we don't have enough water. The problem is that we don't harvest and store it for later use when we do need it. Instead, we let it run off, often eroding valuable topsoil. I'm reminded of that famous dialogue from Auntie Mame: "Life's a banquet and most poor suckers are starving to death." We need to manage our resources more sensibly--and to make better use of resources we have in abundance (such as solar energy). NOTE: The 12 design principles of permaculture are part of the guiding principles the planning committee for the Garland Urban Agricultural Center and Community Garden are dedicated to observing. The availability of water is central to the health of any economy. In fact, water is central to the life of all the citizens in the community. This is a fact that leaders of cities going back as far as Aristotle recognized. Aristotle admonished city leaders to not rely on the countryside for their water but to build cisterns within the city. Furthermore, water, like love of place, can bring communities together. Increases production --It's true. Plant grow much faster and better with rain water than with water from the tap. I've observed it myself in my own garden. Localization - a global manifesto Colin Hines - Localization is a manifesto to unite all those who recognize the importance of cultural, social and ecological diversity for our future - and who do not aspire to a monolithic global consumer culture. The author challenges the claims that we have to be 'internationally competitive' to survive and describing the destructive consequences of globalization. This book is unique in going beyond simply criticizing free trade and globalization trends. It details self-reinforcing policies to create local self-sufficiency and shows clearly that there is an alternative to globalization - to protect the local, globally. Nearly everyone harbors a secret dream of starting or owning a business. In fact, 1,000,000 businesses start in the United States every year. Many of them fail, but enough succeed so that small businesses are now adding millions of jobs to the economy at the same time that the Fortune 500 companies are actually losing jobs. Paul Hawken -- entrepreneur and best-selling author -- wrote Growing a Business for those who set out to make their dream a reality. He knows what he's talking about; he is his own best example of success. In the early 1970s, while he was still in his twenties, he founded Erewhon, the largest distributor of natural foods. More recently, he founded and still runs Smith & Hawken, the premier mail-order garden tools. According to Hawken, a successful business is one that is an expression of an individual person. Investing With Your Values presents compelling evidence that values-inclusive investors can actually outperform the market and be a force for social change. The book's central concept of Natural Investing is a visionary practice that enables people across the entire philosophic and economic spectrum to identify their values and bring them into the financial arena. The American Rainwater Catchment Systems Association's mission is to promote sustainable rainwater harvesting practices to help solve potable, non-potable, stormwater and energy challenges throughout the world. 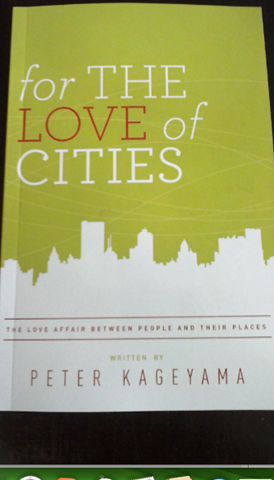 I began reading Peter Kageyama's book, "For the Love of Cities" last night. Yes, I'm the kind of person who reads passages from books that I'm excited about--aloud to my family until they tell me to shut up. I can't read aloud to you, my readers, but I will quote a few passages from the beginning of this award-winning book that no co-creater of their city should be without. This wonderful how-to book is a story, actually a collection of stories about the love affair between people and their places. We hear a lot of talk these days about "livable" and "sustainable", but Peter Kageyama brings another level of depth to the way we view our standards for quality of life. He says that instead of merely livable, we need to start thinking about how we can make our cities more lovable. He speaks of the importance of deepening the relationships we have with our cities and that our cities have with us. Think about this quote from him for a minute: "When we love something, we cherish it; we protect it; we do extraordinary things for it. When we are loved, we flourish as people and are enabled to achieve great things. This mutual love affair between people and their place is one of the most powerful influences in our lives, yet we rarely think of it in terms of a relationship. . . if we as citizens begin to consider our emotional connections with our places, we open up new possibilities in community, social and economic development." In his own words, Kageyama's book is about ". . . what it means to have a relationship with a place, why it matters, how such a relationship grows, how it can die, and how to better understand it. " Like Kageyama, I too believe that incredible things can happen when we fall in love with our city. When it comes to city planning, we all need to add "love" to the vocabulary because love is the most powerful tool we have been given as human beings. I'm especially excited to be among the co-creators for the Garland Urban Agricultural Center and Community Garden Cooperative. I'm also grateful for Douglas Athas, our Mayor. Doug is a thinker and a hugger who is already following many of the principles for strengthening Garland's vitality and economy that Peter Kageyama advocates. For example, Mayor Athas is willing to stick his neck out and take chances with artists and mavericks like me who come to him with unusual proposals. Mayor Athas is the kind of Mayor who supports events such as the "RETHINK COMMUNITY - Garland Texas" and people like Peter Kageyama who focus on creating places worth loving. In the mix of what the Garland Urban Agricultural Center and Community Garden Cooperative are planning there will be strong threads of art and culture. We have just begun the plans for a unique place that we hope all our citizens will love and profit from. Our Planning Committee met last Thursday, October 24 in my home. On Wednesday, October 30, we will have our second meeting in my home. We still have 8 places on the planning committee. If you are a Garland resident and would like to join this committee, please RSVP at eebemma@yahoo.com or call me at 972-571-4497. 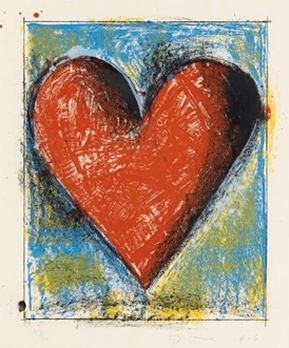 The heart shown above is from the huge collection of hearts over the years created by artist Jim Dine. Among the fundraising plans for our Urban Agricultural Center and Community Garden we are planning a fundraiser for February themed: "Loving Your Place." 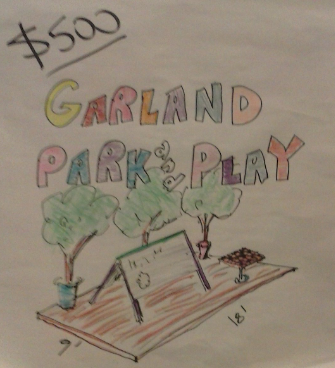 We will feature a contest whereby all citizens of Garland can submit drawings of any size that feature a heart. Folks can submit as many drawings as they wish, but each drawing must be an original piece, created by a Garland Citizen and submitted with a $5 entry fee. A panel of judges will select the best 20 and these 20 will be featured in our Urban Agricultural Center and Community Garden when it opens in April of 2014. Some of these drawings may be created as posters and then sold on an ongoing basis at the Garland Urban Agricultural Center and Community Garden. Also, it is possible that we may have some of the hearts created and painted on metal and installed as permanent sculptures in our community garden. 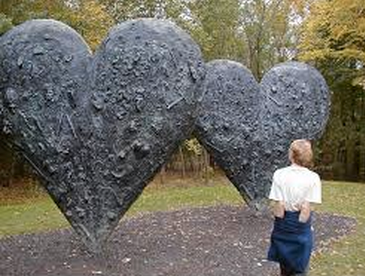 Below is an example of one of many heart sculptures also created by Jim Dine. If it's true that we are only limited by our imaginations and our capacity for love, then we have no limits. Let's get out there and start figuring out ways to show how much we love our city. I just returned homr from an inspiring community event sponsored by City of Garland Environmental Waste Services, Garland Power & Light, and North Central Texas APA. Peter Kageyama, author of for THE LOVE of CITIES, was the keynote speaker. Peter is a community and economic development consultant based in St. Petersburg, Florida. He has spoken all over the world about bottom up community development and the amazing people that are making change happen. Peter's approach to improving cities is to look at what makes cities lovable and what motivates people to do extraordinary things for their places. His book, For the Love of Cities, was recognized by Planetizen as a Top 10 Book for 2012 in urban planning, design and development. My head is still swimming with all the information and insights from this special event which lasted from 8 AM to 2PM today. In addition to Peter's presentation, participants were able to choose two more presentations to attend from several. I chose Glenna Brown's and Lexie Okeke's presentations. Glenna is the Programs Manger for the City of Garland Environmental Waste Services Department. Lexie is the founder of BE the Delta, a company dedicated to serving individuals, non-profit organizations, and social impact concerned businesses. Her presentation focused on how to inspire and keep volunteers and Glenna's focused on waste management from the citizen's viewpoint. Peter's approach to urban development is centered around finding ways to increase the love of citizens for their community, and one of the primary ways he recommends to achieve this is to look for the fun. He believes that most folks tend to overthink solutions. They often believe they need a lot of money to bring forth viable solution. He told the story of a community that wanted a water park, but could not afford one. Then someone suggested bringing a garden hose to the park. Remember the hot summer days when you played in the back yard with the garden hose? Well if you do, you will know how much fun the children had in the park that Peter spoke of. He suggested that we need to bring more opportunities to play to our communities. One of the ways to do this is to ask ourselves: What is the garden hose solution? Purchase a 20' x 30' square of artificial turf, put a blackboard on it, furnish chalk, and move it around from week to week to various areas in the neighborhood. Maybe have one side of it for children to draw on and the other side for their parents to record "bucket lists" BEFORE THE YEAR IS OUT I WANT TO. . . . I learned so much and had a great time today. It was fun to touch base with so many people from city hall again: Mayor Athas, BJ Williams, Scott LeMay, Anita Goebel, Beth Dattomo and others whom I haven't seen for the past couple of months. It was also great to meet and make many new friends. 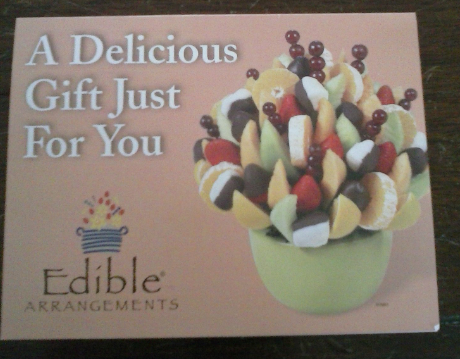 I recruited a new person for the Planning Committee for the Garland Urban Agricultural Center and Community garden--speaking of which, I also won a door prize that I'll pick up on Tuesday, just in time for our Wednesday, October 30 meeting at my home. Hope to see you all back and with lots to share! 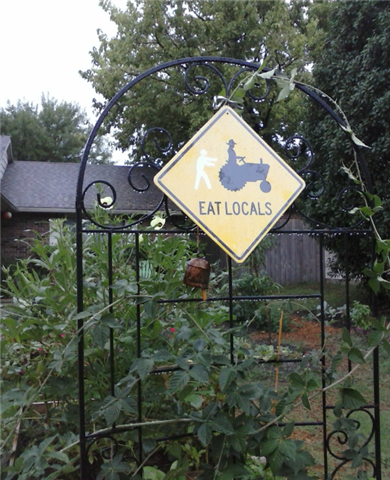 It's not even open and the Garland Community Garden is already producing--in fact, it's probably been producting for about 40 years. 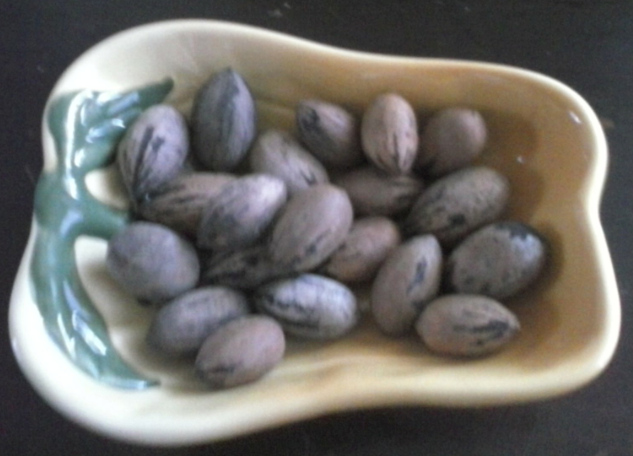 The Texas Native Pecans in the bowl above came from one of the pecan trees on the proposed site for the Garland Urban Agricultural Center and Community Garden. I picked them myself this morning and they are delicious. 11 People Showed Up at My Home Last Night (October 24, 2013)--I rounded out the count for an even dozen! Charlie, Christine, Margie, Robert, Anita, Marie, Yolanda, Sandy, Daniel, Maq Sooda, Mark and me. Robert Opel (a photographer, graphic artist and member of our planning committe) took photos of the group. I'll post it here as soon as I get a copy from him. Perhaps after you see how good-looking we all are you will want to join too. Assignments were taken and our next meeting will be Wednesday, October 30, 6:30 at my home. If you are a Garland resident and would still like to be on the Planning Committee for our Community Garden, we still have 8 places left. Even after that, there will still be room for participation as each of these 12 to 20 members of the planning committee will be forming groups to accomplish their tasks. I'm sure they will need all the help they can get. 1. Obtain estimates for obtaining gravel for roadway on site. - Charlie took this action item. Note: The walking paths between the beds will be mulch. This gravel is for a roadway around the building and also for two small parking areas. We currently plan to be able to park about 40 vehicles on the site. When/if we have events there, we will work out something with the neighbors to park along the first two blocks of Kingsbridge since it is a wide street. 3. Rain barrel and aquaponic setup research. - Mark jumped at the chance to do this one. Also at the meeting, Charlie and Margie brought up two other possibilities for our water supply. Margie mentioned there is an old abandoned well on the site. Perhaps we will be able to restore that well to its old glory. Also Charlie mentioned that we might be able to pump water out of the creek and store it for later use in the garden. We will have to check this out as diverting waterflow from the creek might affect lake levels elsewhere in the county. Tonight Charlie and I plan to attend a Water Harvesting lecture at Brookhaven College in Farmers Branch. 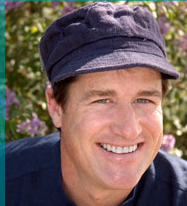 Nate Downey, Landscape Design Expert and author of "Harvest the Rain" is the speaker for this two-hour presentaton about the emerging water harvesting industry. For more information www.dccde.edu/cleaneconomyseries. Perhaps a recycled carport roof. Also 30 chairs suitable for outdoor use and a white board. Research cost for building an 18' x 30' greenhouse or hoophouse. We can have Facebook and Twitter, but we also need a website. Many people are afraid to ask strangers for money. I'm not. I'm already working on our first fundraiser which will be ongoing from now up to Thanksgiving. We will sell one-pound bags of these pecans in their shells for $3 a bag--a bargain if you consider this will help to fund a great venture to be used by all the citizens of Garland. Buy Texas Native Pecans for your special holiday baking and support the development of the Garland Urban Agricultural Center and Community Garden! Note: I'll work with Margie. Also I'll contact Cleo Holden, president of Friends of Olde Downtown Garland. Maybe Cleo will have some old photos when houses were still on this land or know of someone who does. I would love to know and even obtain a photo of the person who planted these trees. Robert (on our Planning Committe) has also promised to assist with the graphics. Perhaps this Saturday I'll round up a few citizens from 2 to 4 to help me gather the first batch. The upcoming fundraiser for December will be the promotions of the Garland Bamboo Tea Company. Then in Spring 2014 I hope to coordinate a DFW Community Garden tour for early June that features as many of the DFW Community Gardens who wish to participate. I'm also hoping to publish a book (local Garland publisher) with photographs and stories of these gardens. I'll begin organizing this fund-raising event in February. Of course in between all this will be applications for Grant fundings which I will spearhead. 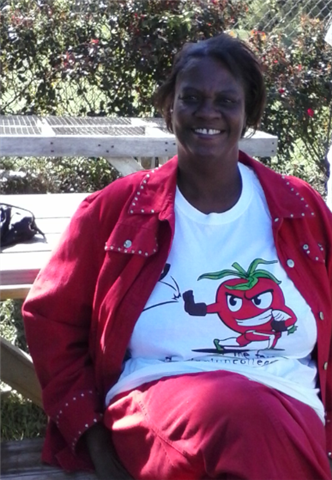 I hope to secure at least $100,000 for our Urban Agricultural Center by March of 2014. The need for affordable housing is great in Garland. Over one thousand people are on a waiting list on the Section 8 Housing Choice Voucher Program. Affordable housing is just another aspect of healthy, sustainable living. I would like to see a small (300 to 500 sq ft) home built on our site as a demonstration model. 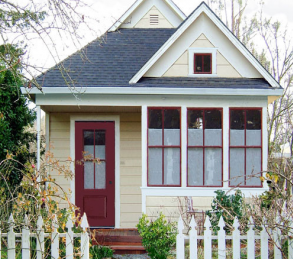 These homes can be built for as little as $29,000. I would like to see a local builder take interest in this concept and build five such homes on a common green (of course with a community garden). Perhaps if one such home were built for demonstration, people could tour it. Then if they decide they would like this for themselves they could sign up, get local funding and the builder could build 5 homes at once--micro villages. To get an idea of the structure of these homes, visit Tumbleweed Houses. The goal of the Garland Urban Agricultural Center is more far-reaching than merely providing garden plots for individual citizens, although it is that too. Our goal is to enhance the quality of life in our community, bring people together to solve local problems and to create jobs and strengthen our local economy by learning together new ways to solve old problems. Instead of battling against nature, the woodland garden works in harmony with it. It comes down to selecting the right mixture of species from among approximately 2,100 that can be grown in the woodland. Unlike the traditional gardens that we will also have, we won't have to replant our woodland garden area year after year because it contains perennial plants. There are many more perennial edibles than many people realize. 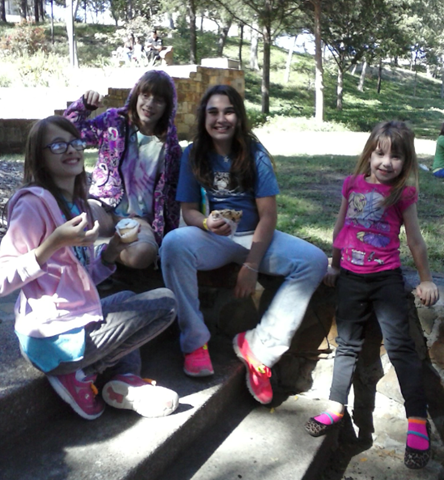 Yesterday was the perfect weather for the Texas Veggie Fair at Reverchon Park in Dallas. The only thing not perfect was the parking. The only parking was on nearby side streets and my family and I had to park six blocks away and walk over broken sidewalks to the fair. I'm glad that Charlie decided to not come with us. With his broken foot, he could not have walked the distance. Still, even though I had to attend without Charlie, my visit to the Texas Veggie Fair was well worth the trip. It was very heartening to realize more fully just how deep and fast the river for rebuilding our food system is running. If the Texas Veggie Fair is any indication, we can safely say that the food revolution here in our area is now on the fast track. 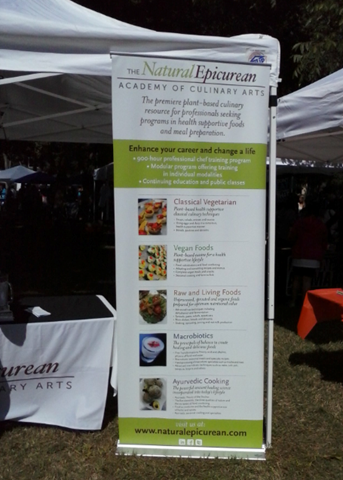 Those who don't believe the food revolution has arrived must not have attended the Texas Veggie Fair yesterday. It was crowded and fun to see so many DFWites turning out for healthy lifestyles. Many of them even brought their dogs with them. I estimate there were over 100 dogs at the event. 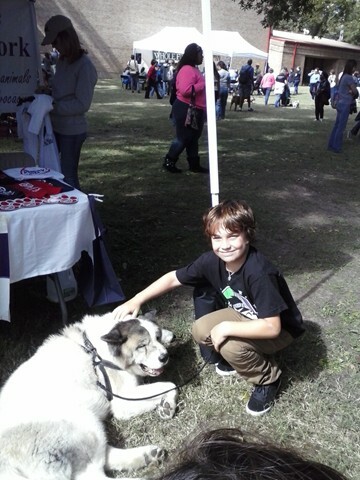 Frankie petting one of the many dogs at the Texas Veggie Fair. Of all the vendors, the vegetarian and vegan vendors were the most numerous. It was heartening to see long lines of people waiting to purchase their food. All types of food vendors were represented: from culinary schools specializing in teaching preparation of vegetarian and vegan menus to food trucks that travel through DFW neighborhoods offering vegetarian and vegan food to organic urban farms. The Good Karma Kitchen offers a gluten-free vegetarian and vegan menu. 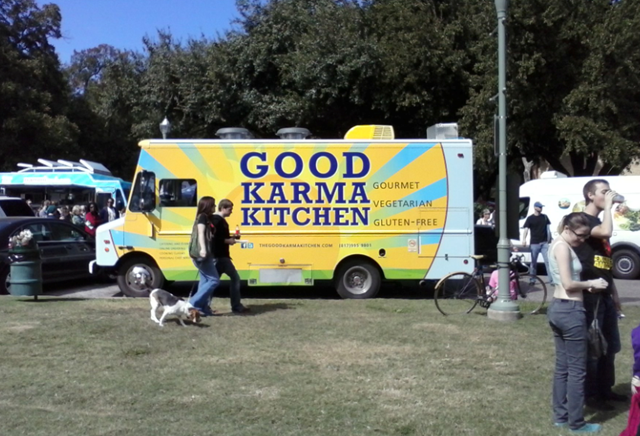 Visit their website at The Good Karma Kitchen for more detail. 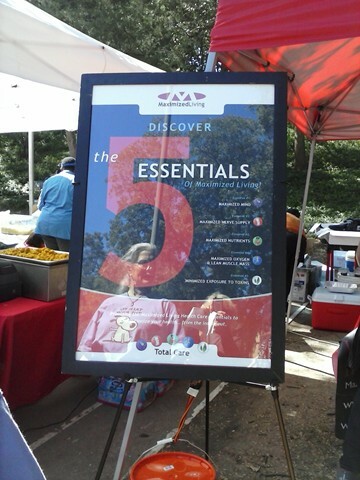 Also Nammi Truck and Gepetto's Pizza were featured at the Texas Veggie Fair. The Nammi Truck -- a Vietnamese Fusion Truck serving up banh mi, vietnamese tacos, spring rolls and much more to the DFW metroplex. Speaking of new business models, Rabbit Food Grocery, one of the featured vendors, is a great example. Although this grocery is local to Austin, those in the DFW can still order items online. They haven't opened a brick-and-mortar storefront, yet. But while they are working on that, those in Austin can still get great vegan items from their online store or at one of their "Pop-Up Shops" around town. If you're local to Austin,TX, simply fill your online shopping cart and choose "Local Pickup" during checkout. There will be a box for you to write in your preferred day and time from our "Pop-Up Shop & Pickup Calendar" as well. Note from iflizwerequeen: This is a model that can work well for DFW entrepreneurs as well as for our many local community gardens who have extra produce to sell. They were at the Texas Veggie Fair. Veggie Garden helps to ensure a cruelty-free diet featuring authentic Cantonese cuisine. Their mottos is "Food is the Best Medicine" and iflizwerequeen could not agree more. Learning what it really means to "live well." Living well is not just about eating more healthy. It encompasses much more and many of the "much more" aspects of living well were also represented at the Texas Veggie Fair. Attendees were invited by the Extraordinary Health and Wellness Center of Plano to discover the five essentials of maximized living: Maximized mind, maximized nerve supply, maximized quality nutrition, maximized oxygen and lean muscles, and minimized toxins. 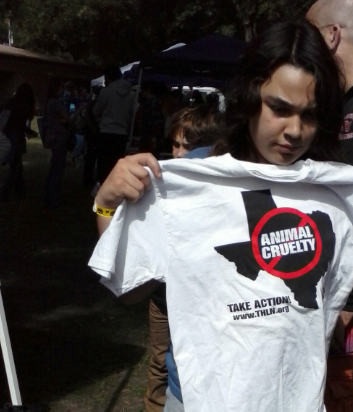 Seventeen different animal rights and rescue groups provided exhibitions at the Texas Veggie Fair--from the Humane League to the Recycled Pomperanian Rescue. Ariel chooses a T shirt to help spread the word about preventing animal cruelty. 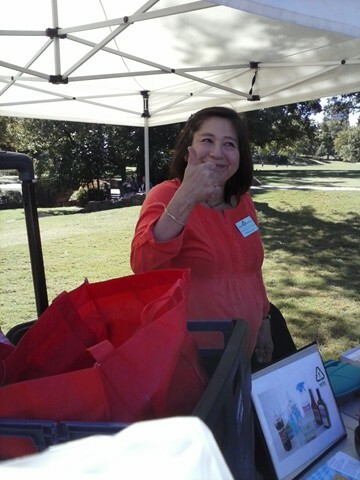 Recycling organizations also provided Texas Veggie Fair goers with presentations on the importance of recycling and Brookhaven College was there to educate us about their clean economy series. Upcoming on October 25 is a lecture: Introduction to the New Water Economy. For more information, call 972-860-4848. Below Maria Lott of Recycle Revolution gives a thumbs up for recycling. Here five-year-old company, Recycle Revolution is one of DFE's leading Zero Waste service providers who offer affordable, effective and responsible recycling and compost collection programs to businesses, apartments and condos. Kobis kitchen for health, beauty and wellness. There were over 85 vendors and exhibitors I counted at the Texas Veggie Fair. I'm sorry there is not room here for detail about all of them. If you didn't go this year, I hope you'll make it next year when I'm sure it will be even bigger and better. In closing, I will leave you with a vegan recipe for Chewy Vegan Brownies. Mix sugar, water, and oil until blended. Add in the dry incredients and mix wel. Pour into an oiled 6 x 9 inch pan and bake ad 350F fr 25 to 30 minutes. Being raised in a small town out in the sticks of West Texas, whenever I go to large events, I always expect to see somone I know. I'm sorry to report that I didn't see a single person I knew other than those from my family who came with me. However, upon leaving, Ariel ran into two of her friends. Ariel and Erin (on the right) posing with two of Ariel's friends. 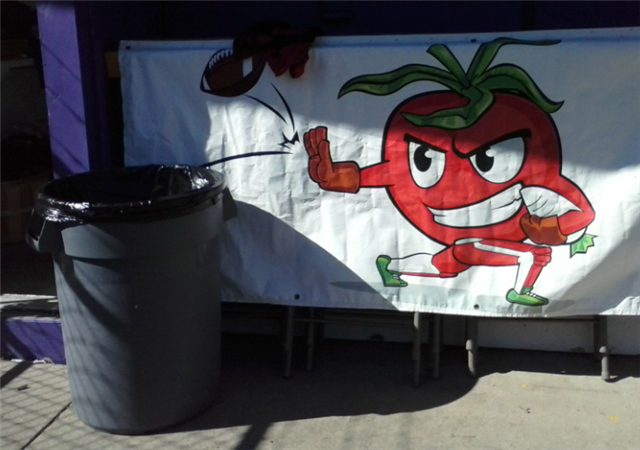 Spike, The Touchdown Tomato is the mascot and logo for the Paul Quinn College urban farm--known as the We Over Me Farm. Spike is toting a turnip and spiking a football. The tomato is an appropriate logo considering that a vegetable patch occupies what was once a football field for Paul Quinn College--almost a sacrilege here in Texas. But Spike pays a tribute to the farm's football roots so all's well. Apparently the Cowboys' fans hold no grudge as many of them who attend Cowboy games also eat salsa made from vegetables produced at the We Over Me Farm. According to their record-keeping, this two-acre former football field farm has produced over 15,000 pounds of 100% organic produce since it began in March 2010. The farm is also home to four active beehives that are maintained by members of the Texas Honeybee Guild, about 16 hens, at least one peacock, and an aquaponic system that supports approximately 100 tilapia fish. This is all in addition to tomatoes, kale, turnips, radishes, onions, Swiss Chard, mustard greens and basil currently growing on the farm. Hannah Koski, a horticulture graduate from Cornell, has been the manager of this urban farm for the past four months. She is one of many people who are growing this urban farm into a huge success. In addition to Hannah, there are of course many of the students who attend Paul Quinn College who are helping to make this urban farm a success--a few of whom will be featured in this article. Ashley Daly is another dynamo who is bringing the news of the We Over Me Urban Farm to the world. Ashley is in charge of media marketing and public relations for Farming at the Paul Quinn College. From the looks of things today, Ashley is doing a great job. A team from PBS was at the farm interviewing and filming Hannah in the fields and later interviewing some Paul Quinn College students in the greenhouse where the aquaponic system is located. Speaking of the greenhouse. . .It is huge and appears to be "nearly new" as there is a lot of unused space. 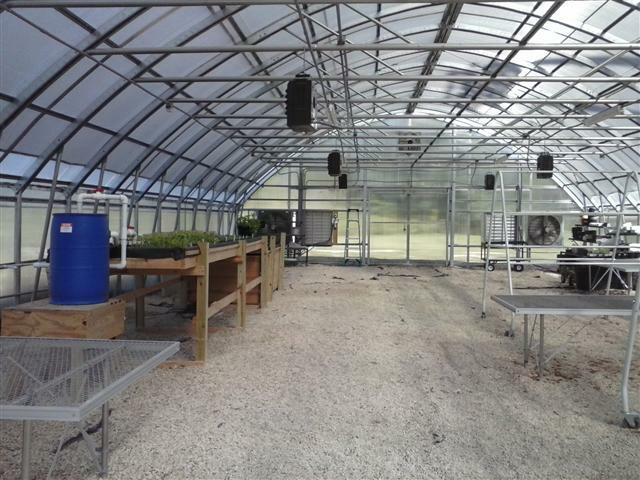 Currently it houses an aquaponic tank filled with approximately 100 tilapia. 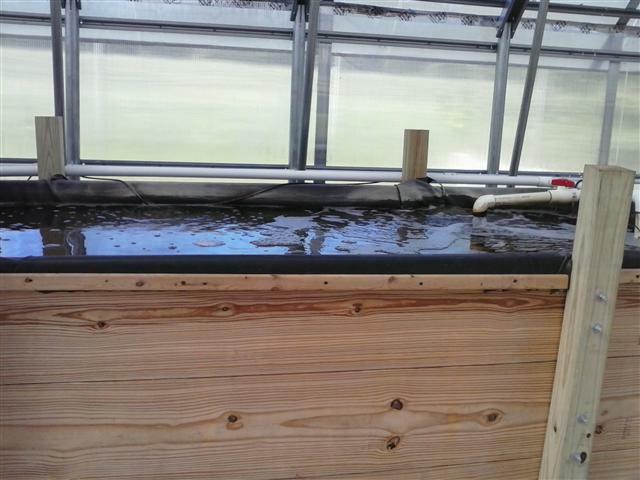 The waste from the fish is nourishing seedlings that are housed in trays in another tank. It appears that the tank is large enough to nourish at least twice the plants that are currently being fed by the system. No doubt that will happen in the future. Hannah mentioned that the other half of the greenhouse will be reserved for raised beds where tomatoes and other vegetables can be grown year round. Aquaponic designers from the community are assisting in the design and expansions for the aquaponic systems. Below is a photo of the tank that houses the tilapia. It is located near the back of the photo shown above. Volunteers and Students from Paul Quinn College contribute greatly to its growing success. Below are featured a few of these people. 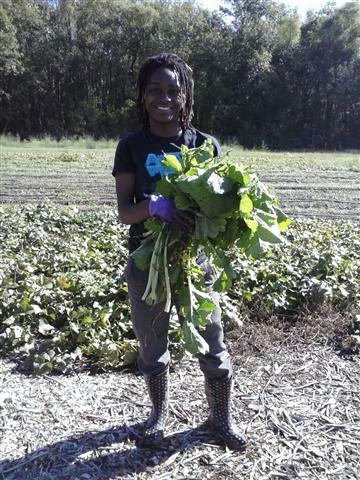 Claudea Locke, a Paul Quinn College student, is featured below with a "mess" of turnip greens. 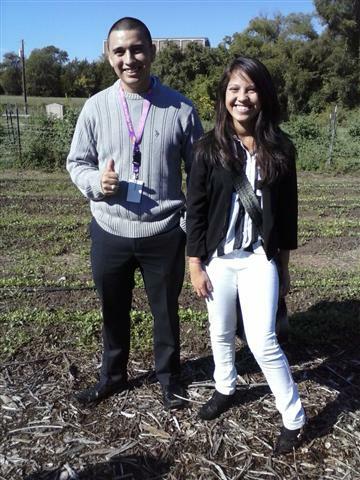 Alyssa and Anacleto are two Paul Quinn College students featured in the next photo. Anacleto is from Dallas, and Alyssa is a freshman who hails from Detroit. She was convinced to attend Paul Quinn College when President Sorrell came and talked to a group of students in Detroit about the college, its commitment to community and the urban farm. 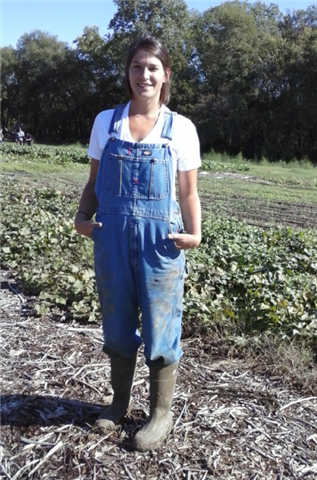 Below is another of several students working at the farm this morning. This young man is planting seeds. Chickens, yes the We Over Me Urban farm not only has chickens, they also have a peacock. I didn't get the scoop on the peacock, but for some reason it does not live within the safety of the enclosure for the laying hens (currently numbering about 14). I'll have to ask Hannah or Ashley for more information about this critter. 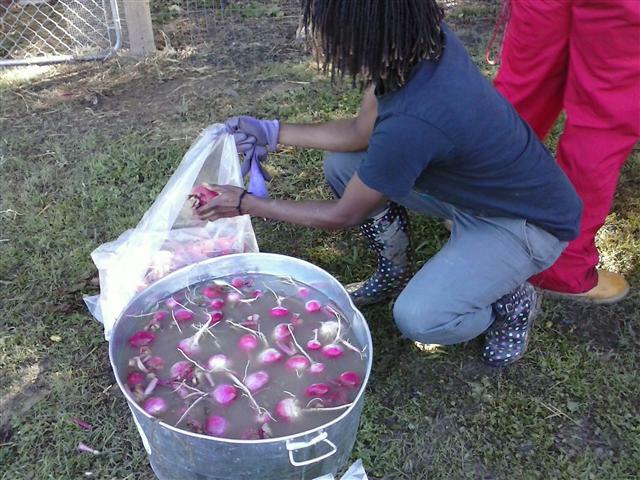 Below is a photo of the Claudea washing and bagging the turnips (not radishes). 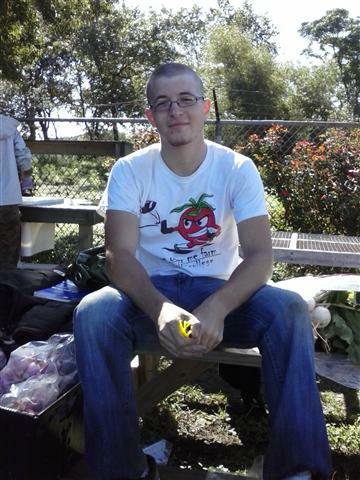 Here is photo of another Paul Quinn College student--Timothy Tucker. Although Timothy grew up in nearby rural areas and knows a lot about farming, and even though the farm is one of the reasons he chose Paul Quinn College, this honors student is interested in marketing and hopes to one day land a job at Sony. To get some experience in between here and there, Timothy is creating some informational brochures about the farm. Cynthia Dade is a volunteer and supporter of the farm. Cynthia reported that she and members of her family have purchased over 100 pounds of delicious watermelons from the farm. I know where I'm coming next year for at least a few of my watermelons. Currently you can call We Over Me to place an order of basil, heirloom tomatoes, mustard greens, rosemary, specialty radishes, specialty turnips, swiss shard and organic free-range eggs. Call to order and pick up by appointment: (214) 379-5457. 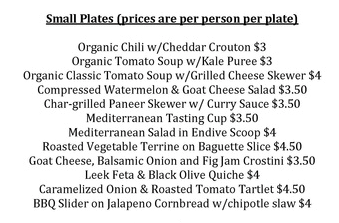 You can also email Hannah at hkoski@pqc.edu to place your order. Cash and checks are accepted. 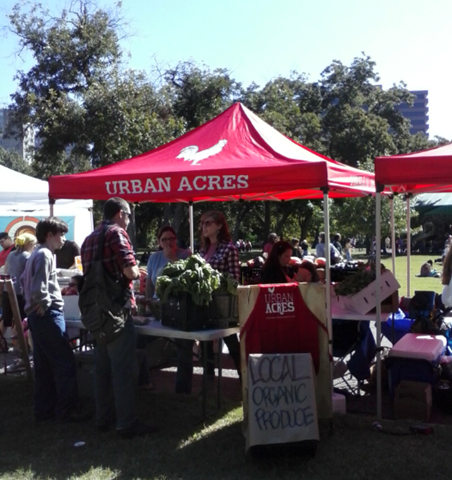 Produce from the We Over Me farm is also sold at the White Rock Lake Farmers Market from 8AM to 1PM every Saturday! 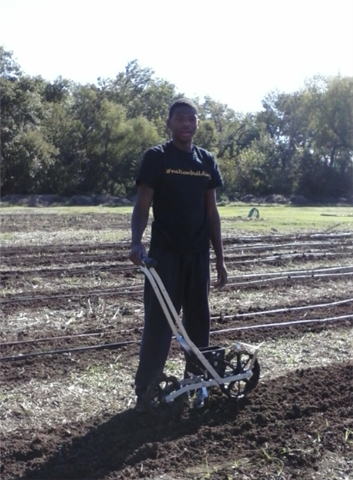 Our last photo is of another Paul Quinn College student who also works on the farm: Chakesha Smith. 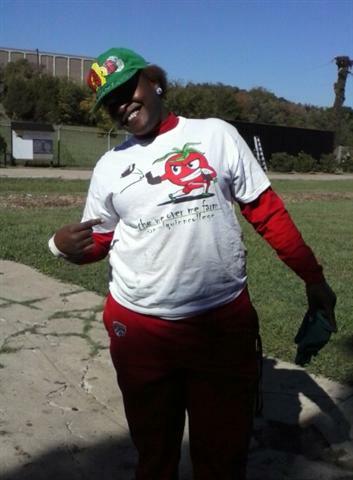 Like many of the others, Chakesha proudly wears a shirt with Spike, the Touchdown Tomato. Preparing for an Upcoming Garland Community Garden and more! In addition to decorating Urban Garden One for Halloween [the garden that now takes up about 1/3 of what was once my front yard lawn] I've also been busy talking with various members of the Garland city government regarding the establishment of a community garden which will be located at 4022 Naaman School Road near the junction of Brand and Naaman School Road. One of my concerns was the area proposed for us for this garden would be a flood plain. 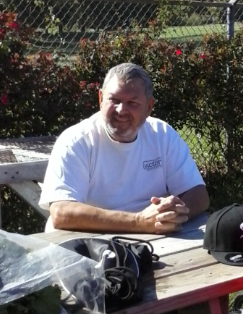 However, just yesterday I learned, after talking with Thomas Guillory from the Garland Engineering Department, the flood plain is primarily located on the other side of Spring Creek--not on the side designated for the garden. The garden site is three acres of non-flood plain area. A planning committee is being formed and we will have our first meeting at my home at 6:30 On Thursday October 24. Thus far, there are ten people from Next Door who have expressed an interest in being on the planning committee. All interested citizens from Garland are welcome to participate in this venture. If you wish to be on the planning committee, please call me at 972-571-4497. We will have to close invitations at 20 people but I'm sure as the plans expand that these people will form subcommittes as well. There will be lots of opportunity for citizen involvement. My vision for this garden involves more than creating 40 to 50 garden plots, although that will be part of our plan. I am hoping that we can create a space that will serve as a living demonstration center and incubator for innovations that will inspire solutions to eliminate food insecurity in all of Garland; provide affordable housing solutions for all our citizens; and will inspire citizens to create new businesses to meet some of the new demands generated by focusing on building a local plant-based economy. *Hand in hand with re-thinking our food system is re-thinking other healthier and more affordable approaches to living. For example, most of us don't need nearly as much square footage as we currently build into our homes. I would like to have a living demonstration of that in our garden. *This home (open for tours on the site of the Spring Creek Garden) would perhaps inspire a developer to create a small village of 5 of these homes on a common green. The aquaponic tanks would inspire people to build their own aquaponic tanks at home and could even inspire the establishment of a small local business to build them. These are just a few examples of the potential to inspire that can expand from our community garden. Urban Garden One is all decked out for Halloween! 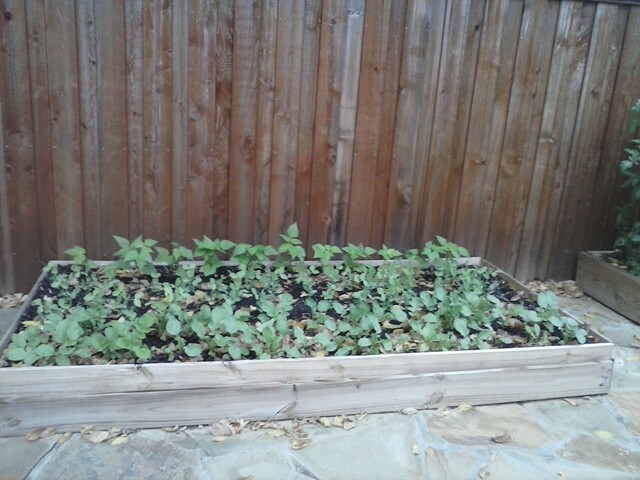 Located at my home 216 East Kingsbridge Drive Garland, this garden provides for about half of my meals and provides food for two other families. Prior to my establishment of the garden beginning June 12, 2013, my lawn fed no one and cost me more to maintain than my garden. 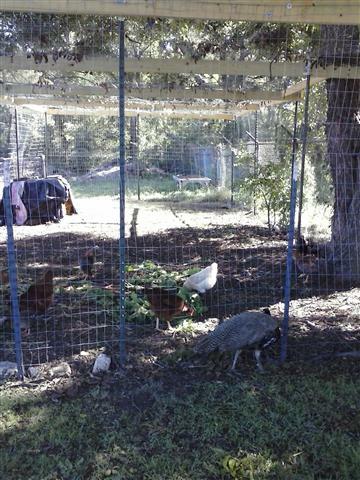 It's interesting that previously I tried and tried to get a community garden going here in Garland. Then I gave up and out of frustration started my own version of one. Lo and behold: Four months later, I've gotten permission to establish a community garden on city-owned land. 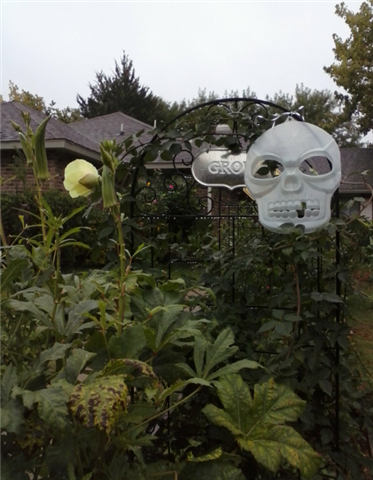 Here we have a glow-in-the-dark skull amongst the Okra. 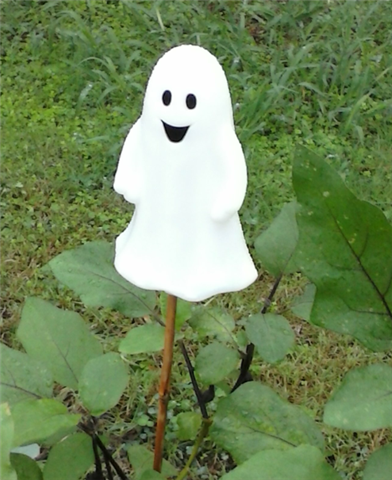 Below we have a ghost amongst the eggplants. No Halloween decorations would be complete without a zombie chasing a farmer.